I have a confession to make – I think I like winter. This may not sound like much to most, but for me – a diehard beach girl – this is HUGE. This winter I’ve taken four trips to colder climates; you may recall my piece on a Girls’ Winter Getaway to Lake Placid, New York. Well, more recently, I visited Haywood County in North Carolina’s Smoky Mountains and had even more fun in the snow! Fortunately, my bags were not really unpacked from Lake Placid, so after a bit of laundry I was ready to head back north, this time to Haywood County, just west of Asheville. Though many may not think of the Smoky Mountains as a wintertime getaway, they really should! I met some friends and we started our getaway in Haywood County skiing. Yes, skiing! Once again, I took ski lessons and felt a bit more confident on the slopes. 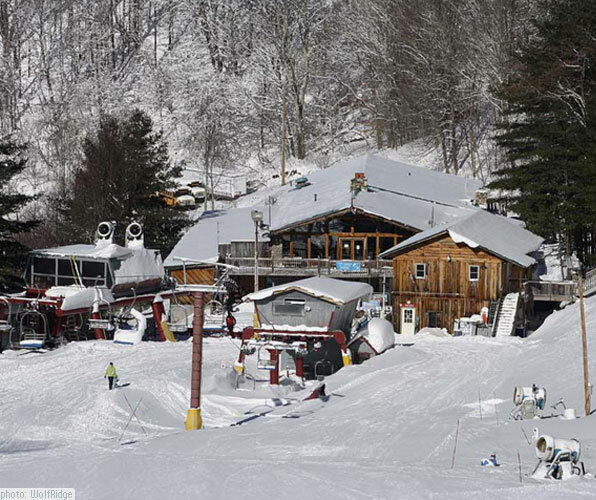 At Wolf Ridge Ski Resort (just outside Haywood County, in Mars Hill in the Blue Ridge Mountains), the instructors were again very patient and very kind, even getting onto the snow to help guide my skis in the right direction. Definitely a terrific place for an uber-beginner like me to get her ski legs! After two days of skiing, my friends and I decided to go a different route and take to the mountains in a different way – with our hiking shoes. We laced up and took a four-hour, nearly-seven-mile hike at Purchase Knob with Ken Czarnomski, a local naturalist and creator of trail loop guides. Ken was fantastic, pointing out sights and plants and trees that we may have overlooked had he not been with us. Now, I’m not being boastful, but I am active and work out a few times a week, but I do live in Florida with little to no elevation. However, I don’t think anything could have prepared me for the hike – the views were gorgeous and the hike itself wasn’t too strenuous, but for days after, I certainly felt it in my legs! Just a reminder that hiking can often be a way to exercise (and burn calories) without really thinking about it! Speaking of burning calories, I needed to do just that after indulging in the good eats and sips found throughout Haywood County. There were breakfasts at Joey’s Pancake House (holy pancakes!) and Panacea Coffee House, lunches at Cataloochee Guest Ranch and Boojum Brewing, and dinners at Haywood Smokehouse, Bourbon Barrel Beef & Ale (reservations suggested and strictly adhered to) and The Imperial. Needless to say, there’s no shortage of good eats in North Carolina’s Smoky Mountains! I also had to buy some freshly-jarred jams and veggies at Copper Pot & Wooden Spoon to take a taste of the Smokies home with me! There’s no shortage of drinks, either! Haywood County’s craft beer scene is thriving, and for those who enjoy a pint or two, be sure to stop by Frog Level Brewery, Boojum Brewing and BearWaters Brewing and decide which is your favorite local brew. I think one of my favorite places to window shop, and make the occasional purchase, is in Hazelwood Village. The adorable, two-ish-block-long shopping area is rich in cute shops, including Robin Blu Boutique and Hazelwood Soap Company, not to mention Smoky Mountain Roasters for a quick pick-me-up cup of coffee. After days filled with activities, whether on the slopes or shopping, my friends and I made ourselves right at home in the huge cabin we stayed for a night at Wolf Ridge Ski Resort (slumber party, anyone?! ), and at The Waynesville Inn Golf Resort & Spa with its spacious rooms and sweeping grounds. Our time in Haywood County was short, but I think it’s safe to say that we’ll be making a return visit, and hopefully soon!